Los Angeles interior designer Matthew Lanphier has a background in architecture and a knack for creating magazine-worthy spaces with a comfortable feeling of home. He's remained true to exceptional form in this L.A.residence located in central Santa Monica, which the designer describes as being, "not close enough to the beach to be considered beachy.” The 3-bedroom home, which was designed for a male client with two soon-to-be-teenagers, combines a modern sense of masculine luxury, with the laid-back feel that we all expect from Santa Monica homes, even when they're too far away from the beach. 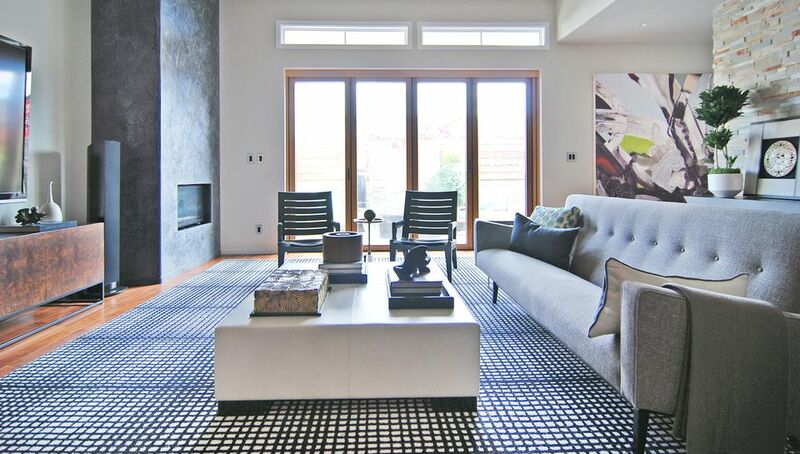 The living room definitely sets the tone for the space with its mix of masculine energy and high-end aesthetics. A cool color palette of grays, whites and other neutrals is complemented by a variety of tough materials including stone, metallics and wood. A custom patterned rug both defines the space and adds the major pop of pattern to the room, assisted by the textures of the metallic credenza, stone fireplace and tiled back wall. The sofa will always be the center of every living room. And in this space, a Vladimir Kagan sofa purchased from Ralph Pucci commands the stage masterfully. On the coffee table in front of the sofa, decorative accessories in hard materials - stone, wood and metal - help to reinforce the masculine aspect of the space. Here we also see one of the living room's more subtle twists in the way that color is layered in different ways. Note the number of brown accents in the space, on the coffee table, the stair case and even the stone tiled wall. Spreading small pops of the color around helps to warm the space in an even way without competing with the main colors of the room. To the left of the sofa, a long hallway leads into the kitchen, but not before taking you past a few of the living room's feature furniture pieces. In seeking to give the space a modern feel, the designer chose Christian Liaigre side chairs from Holly Hunt. The color and shape of the chairs perfectly echo those of the streamlined and ultra-modern credenza set against the back wall. Moving closer to the kitchen reveals a stunning art wall decorated with only one piece. This beautiful abstract work brings a splash of bright colors to the space while turning an ordinary hallway into a visual attraction. This vantage also provides a better look at the wood flooring and the ways that Lanphier has blended colors to make this space a perfect mix of warm and cool shades. To the right of the couch lies the dining room. Proper lighting is one of the most important parts of decorating a dining room, a feature that this space has well covered. Yet here the designer goes a few steps further, putting `a metallic finish on the ceiling to highlight the array of modern pendant lights. Once in the room, an intimate dining arrangement awaits the next family dinner or night with friends. Cow hide chair covers guarantee a night of dining in comfort while mirroring the black and white arrangement of the lights overhead. At the center of the table, a single metallic bowl stands out in a room full of wood. Behind the dining room sits the entryway, which greets all comers as they arrive at the home. Though by itself the entryway only occupies a small amount of space, not a single inch has been wasted. A polished mirror with a decorative frame is set above a small bench with stone legs for a simple yet sophisticated entryway. This bathroom is as much a study in modern minimalism in bathroom design as it is in blending warm and cool colors for a balanced look. But the use of contrast doesn't stop at the colors. A rustic, pump-inspired sink adds a bit of curve to this streamlined space. This room, designed specifically for the client's daughter, is one of the home's true bright spots. Charming with just a hint of whimsy - courtesy of the sunburst mirror and polka-dot window shades - it's the perfect space for making the transition from a colorful kid's room to the kind of space that a teenager will want to occupy. And for the client's son, a room that is essentially the mirror image of the daughters. Nearly every element from the preceding room is present here, but with tiny, subtle tweaks that give the room a personality all it's own. Here a star mirror replaces the sunburst above the bed. A more colorful version of the cool color palette that fills so much of the rest of the home replaces the warm neutrals present in the other room. Even the lamps, which are nearly identical, are slightly different. Together the two spaces do an excellent job of expressing connection while providing ample room for individual identity. This spacious, well-lit master bedroom suite is a world unto itself complete with fireplace and side seating area. The room features a mix of pattern types, from the strong geometric of the floor to the nature-inspired wood grain pattern of the bed. Again, warm notes of brown appear to break up the cool blues and grays that dominate the room, creating an air that is relaxing yet approachable. Next to the bed, a small vignette offers the perfect place for a moment of quiet repose. Ultra-modern furnishings are a staple of this home and this small area shows how the designer was able to mix the various shapes and textures of contemporary pieces to create an eclectic yet unified look. Art is the perfect finishing touch for any space, and in this bedroom the art has a space all its own. With the ideal amount of space for working on a laptop, this bedroom office dedicates the rest of it's area to art, from the tabletop to the walls. The large abstract work in black and white was created by L.A.-based artist Lana Gomez. What would a home in Santa Monica be without an amazing outdoor space? Fortunately that's not a question that this home asks us to answer. Here Lanphier creates an idyllic outdoor space, mixing natural elements with sculpture and a beautifully symmetrical design. It's the perfect place to start the day, end it, or just sit and watch it all go by.